Coin Investment Yield Calculator. FREE. Compute Return Rate for Your Rare Coins. Use our FREE Coin Rate of Return Calculator to determine how fast your collectible coin is increasing in value. The calculator will compute the effective compounded annual rate of return percentage. How does it work? Go to the calculator found immediately below, and enter the required data according to instructions on the left. The necessary data consists of how much you paid for the coin, what it is worth today, and how long ago you bought it. The annual rate of return for your coin will then be calculated for you. Let's say you have a coin you purchased for $150 six years ago. You looked up the current value in today's market and discovered the coin now has a retail value of $250. When this data is fed into the calculator, the answer given is 8.88%. This is NOT saying the coin increased 8.88% every year over the six year period. A better way to think of it is that the coin averaged an 8.88% increase annually over the six years. Step 1: Enter the Purchase Price of the coin. Clear field first, if needed. Step 2: Enter the Selling Price of the coin (or best estimate of what the coin is worth). Step 3: Enter the number of Years Held. Count the year purchased as Year 1. For instance, a coin purchased in Year 2014 and sold in Year 2019 is held for 5 years. You may use entries such as 4.75 (for 4 years, 9 mos.) to fine tune your result. Step 4: Then, click on the "Calculate Coin % Rate of Return" button to view the coin's compounded annual rate of return percentage. This calculator does not compute negative rates of return. Therefore, the entered Purchase Price must always be less than the Selling Price. The number of Years Held must be 1 or more. EXAMPLE: Coin Purchase Price is $1,000. Selling Price is $2,000. Held for 4 years. Step 1: Enter '1000' (without the apostrophes) for the Purchase Price. DON'T enter '1,000' (i.e. NO commas). Step 2: Enter '2000' for the Selling Price. DON'T enter '2,000' (i.e. NO commas). Step 3: Enter '4' for the Years Held. 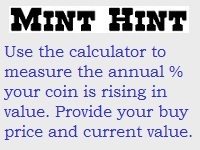 Step 4: Click "Calculate Coin Annual % ROR" button.